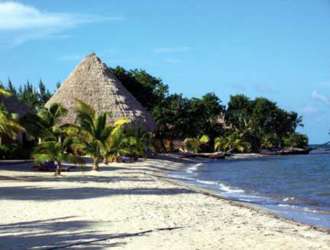 The Turtle Inn is now one of the most unique and magnificent resorts on the Placencia Peninsula. The Coppolas' wanted to enhance its unique charm and bring it to the level of luxury and comfort that guests of the sister propeprty Blancaneaux Lodge in Mountain Pine Ridge, have come to expect, but in a totally different style. Rather than the rich Mayan textures, fabrics and artifacts used at Blancaneaux, Turtle Inn has an almost rustic quality to it, without sparing any real comfort or luxury! Spending nights on the beach and witnessing the calming sunsets, Coppola found a serenity, peace and beauty that reminded him of the Balinese culture. This became the distinctive style for the treatment of the new Turtle Inn, with gardens, stones and fabrics of Bali. The Inn has a full compliment of amenities, including a spa, gift shop, restaurants and bar, dive shop, and of course, pool and white sand beaches. Each cottage is nestled in a private garden and features an outdoor shower, screened porch, private bathroom with a Chinese bath and a queen-sized bed, Balinese hand-carved doors and decor throughout and just steps from a beautiful stretch of beach and the Caribbean Sea. Guests can choose from Poolview, Seaview, Seafront or Honeymoon cottages.